You know what they say about how being forewarned is forearmed? Here is my forewarning: keep a box of tissues handy. I realize I’m one of the few YA aficionados who has not read The Fault in Our Stars, but I just can’t. Not right now. I don’t want to be sad because I always think that characters in books are real, and I’ve heard things about The Fault in Our Stars. Things that make me think I’ll cry, and I’m an uglier crier. Well, the thing is, I didn’t know a whole lot about Maybe One Day prior to reading it, and I admit that what little I did know seemed to hint that it was Fault in Our Stars-esque. But I didn’t think about what that meant, you know? Clearly, given the hefty number of stars that I gave this book, I liked it quite a bit. But enjoying a book like this feels wrong on some level, kind of like laughing at a dirty joke. You know you shouldn’t, but you just can’t help it. But enough of this caterwauling. Maybe One Day is very good, and it is, at times, very sad. Zoe tells us about the events in her life that occur over the course of a little less than a year. The novel begins with Zoe and best friend Olivia getting kicked out of a premier New York City ballet corps, something the girls have spent most of their lives focused on. Whereas Olivia is not ready to give up on dancing, Zoe is. She tosses her shoes, leotards, and even gets her hair chopped off. When something unpleasant happens, Zoe reacts by removing as much evidence of it as she can from her life. Olivia, though, begins teaching some at risk kids in a community center near their New Jersey town. As she and Zoe ponder their upcoming junior year, Zoe feels the surge of energy that comes from knowing – just knowing – that it’s going to be a great year. But then Olivia gets diagnosed with a particularly virulent strain of leukemia, and Zoe realizes that this may not be a great year after all. There is quite a bit at play here, and sometimes you wonder how Melissa Kantor can juggle all of her elements. First, we have the friendship between Olivia and Zoe. It is not perfect, but it’s solid. At one point, Olivia’s mother tells Zoe that most people only have one or two true friendships, and you know she’s correct. Olivia and Zoe are fully invested in each other’s lives. Zoe may have quit dancing, but she supports Olivia’s decision to teach the little girls, just as Olivia respects Zoe’s need to step away. Zoe may not understand Olivia’s attraction to her brother’s best friend Clayton, but Zoe tolerates it and encourages Olivia. Zoe’s dislike of Clayton dates back to him interrupting her first kiss, so of course she finds him distasteful. Family is another focus. There is what we think of as a typical family – parents and their children – and then there is what we think of as our family – our blood relations and our friends. When Olivia’s mother casually refers to Zoe as a “visitor,” Zoe is offended. She’s more than family. Isn’t she? She feels like she is, like she should be. Kantor examines the nature of friendship as well. Yes, Olivia and Zoe are friends, but so are Olivia’s brother Jake and Clayton. When Jake visits Olivia, Clayton often is with him. It takes Zoe a while to make the connection, but she eventually gets it. She and Olivia may have a nearly symbiotic friendship, but theirs is not the only one. And what of other friends? The kids at school hold a carwash to raise money to fight for a cure for leukemia, some of them considered by Zoe as having “cotton candy” for brains. But they’re there, and they try. They bake casseroles for Olivia’s family, and they offer emotional support, even if Zoe finds it hyperbolic. She wonders if people use Olivia’s illness for their own means, which is poignantly echoed by Zoe’s mother cautioning her to not do that very thing herself. Of course, this is the story of cancer, too. Olivia undergoes all manner of treatments, from chemo to more invasive procedures. Kantor doesn’t inundate or overwhelm us with too much medical-speak, though. She presents the facts about leukemia and treatment options, but cancer itself is as prevalent a character as any in the novel. Prevalent and malevolent. Then there is the element of religion. Kantor never fully develops this, and it’s a shame because you wonder what she could have done with it. She comes so close, but she never commits. Zoe and her family are resolute in not believing in God. Zoe acknowledges that she thinks there might be a heaven, but God? God wouldn’t let someone like Olivia get sick. That she is fighting such a horrendous disease means God cannot possibly exist. Olivia’s family, on the other hand, is devout. Her mother decries saying something as tame as “Oh, my God” because it is blasphemous. They pray, and they receive strength from their faith. Like I said, though, Kantor sort of leaves this dangling; you don’t really know what she wants us to take away from it. There are a few other weaknesses. The rift that forms between Zoe and Olivia heals quickly, but perhaps that’s because both realize that you just don’t know how much time you have. A romance Zoe enters also has a tidy resolution, and the rec center dance class also comes together a little too tidily. I have one other question, and after you read the book, come on back and discuss it in the comments section. Did Jake actually date Emma the stalker cheerleader? I hope not. If he did, it seems to show that if you throw yourself into the path of the boy you like – repeatedly, never leaving his side, always making sure you’re THERE – then your fairy tale dream will come true. But those are mild quibbles, I admit. Zoe and Olivia’s friendship is the core of the novel, and it is presented lovingly and respectfully. Zoe’s heart breaks for her friend. 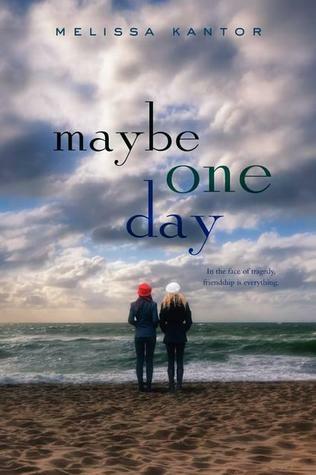 As Olivia battles cancer, Zoe tries to be what Olivia needs her to be, but sometimes she woefully misfires. A particularly moving scene occurs when Olivia demands that Zoe talk to her about death. Zoe doesn’t want to – of course she doesn’t – but not just because it makes her uncomfortable. She also believes that doing so will hurt Olivia, perhaps even setting back her treatment. Oh, it’s sad. There are parts that are difficult to read, so raw are they. Kantor is at her best in the scenes between Olivia and Zoe, when two teenage girls try to face – together – the unimaginable. Read it. But have tissues handy. Get ready, kids, because I am about to gush. The short version: I really liked this book. Really, really liked it. It isn’t without its flaws, but it’s just so good! Okay, now the long version. Life hasn’t been all that grand for Louisa Clark. It hasn’t been terrible, necessarily, but it has left her wanting. She eschewed university to work in such glorious jobs as a coffee shop attendant, and her boyfriend – well, the boyfriend is more obsessed with his marathon techniques than being a boyfriend. Her parents struggle financially, her older sister is a selfish single mother, and her grandfather has Alzheimer’s. So when an opportunity comes for Lou to work as a caretaker for Will Traynor, she takes it, even if she has no idea how to take care of a quadriplegic. For his part, Will struggles with being a quadriplegic. He used to scale mountains (and get scaled by comely lasses … if you know what I mean … wink wink), and he was a powerful force professionally. Everything he valued and cherished evaporated in the seconds it took to fall victim to a car accident. The two get off to an inauspicious start, but slowly they fall into a pleasant routine. Lou gets to know Will, or gets to know him as much as he will allow. He is not one to trust quickly, and undoubtedly he is even more reluctant because his autocratic mother hired Lou without his input. To go from being a man in control – a man who could wake up and decide to ride a motorcycle or go snorkeling or whatever he damn well pleased – to a man who has to have his catheter inserted is a chilling, maddening proposition. What Lou can’t see is that she is every bit as paralyzed as Will. While she may be able to walk and move her arms, she nonetheless is stuck. Professionally, personally, emotionally. She is trapped in a metaphorical wheelchair of self-doubt, every bit as unable to leave it as Will is his. Before you think you know how this will play out, let me tell you that you do not. Yes, Lou and Will grow closer. How can they not? They may even develop romantic feelings for each other. 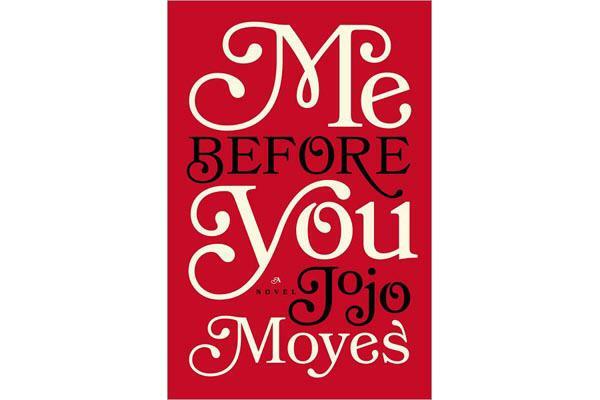 But just when you think you know how the story will end, Jojo Moyes takes you in a whole different direction. This sweet, slightly melancholic story becomes far more emotionally charged, as Will discloses his desire to end his life. Moyes adeptly and succinctly presents both sides of the assisted suicide debate, letting each have its say. Lou and Will’s mother are adamantly opposed, but Will’s reasons for it resonate. When he tells Lou why he feels he must do this, you cannot help but be affected. When she pleads with him not to go through with it, your heart might break just a little. As lovely as this book is, it does have one glaring flaw: the supporting cast is straight out of Central Casting. There are no surprises, whether it be the frosty wife who suspects her husband is cheating on her, the quirky friends, the self-absorbed boyfriend. We have seen these characters before – a LOT – so it is almost insulting that Moyes, who writes such a beautiful story that defies categorization should rely on stock characters. Fortunately, you don’t see a lot of them. The focus is on Lou and Will. Which is as it should be.